Rising Investment Volatility: How Concerned Should You Be? Equity markets around the world have been volatile of late, and whenever this happens, investors naturally look for explanations for the downturn and wonder whether they’re in the right investments. We believe this response to volatility, although natural, is likely unhelpful. Instead, you are better served by putting recent market movements into the context of what’s important to you in the long term. For example, looking back a decade to the massive market decline of 2008, consider this question: Would you be closer to meeting your long term financial goals by having sold out of equities after double-digit losses only to miss the rebound and one of the longest bull markets in history? Putting market volatility into context is a much better way to react than trying to understand every market move or selling at the wrong time to quiet fears. Predicting how macro-economic issues will work out or how they’ll affect markets is next to impossible. Volatility can be upsetting, but selling after significant losses can be counterproductive. We believe valuations, not volatility are the key to portfolio reallocation, although sometimes high volatility may open up attractive valuation-driven purchases. The good old days seem to be quickly sliding into the past. As recently as a year ago, markets were on a joyride. Ever higher returns pushed painful memories of the Global Financial Crisis (GFC) further and further into the background. The fear index, also known as the VIX or more formally the CBOE Volatility Index, rises during periods of market stress. But in 2017, the VIX couldn’t have been less scary, as it set record lows amid a seemingly ever rising market. In fact, from January 1990 through December 2016, the VIX fell below 10 on nine days (nine days in 27 years!) but in 2017 it sat below 10 for 52 days so calm were the markets. All demonstrating how quickly investor sentiment can change and evolve. Whether the market is, or will become completely comfortable with all or some of the concerns above remains to be seen. 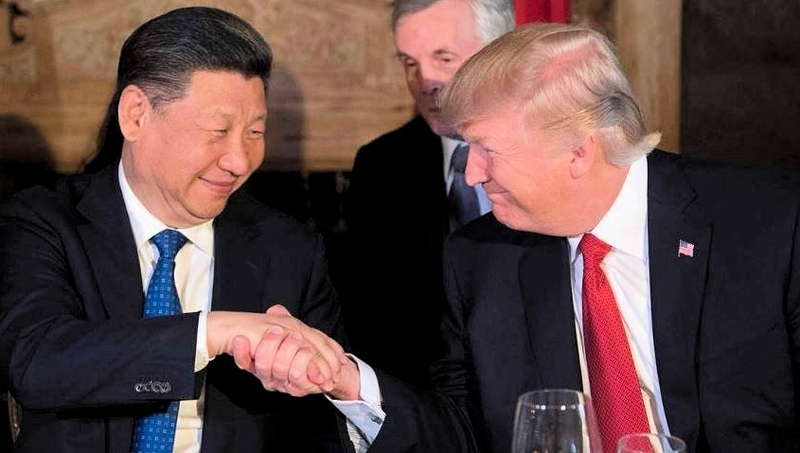 In the US, reaching a new North American trade agreement gave some relief, but progress has been elusive in talks with China, a situation that appears poised to potentially flare at any moment. Europe’s slow growth is fragile, and it looks likely Australia will have another change of Prime Minister in May 2019. But again, knowing when a flare up around these issues might happen, how long it would last, and how it might impact investment markets strikes us as a monumental task. Fintech’s investment management committee think there’s a better way to invest. Specifically, we don’t believe every market hiccup needs deep analysis, nor do we read tea leaves. We prefer to focus our work on fundamental research, contrarian signals, and investment valuations. In the long term, you get paid by the current and future cash flows of the shares and securities you own. We seek to buy securities when prices are low compared to expected cash flows. This valuation work is the driver of our research, and it relieves us from becoming overly concerned about the next central bank rate decision or the outcome of an election. Should We React to Spikes in Volatility? Investors who trade on emotion and short term market moves are more likely to sell after markets have gone down and buy after they’ve risen. We seek to do the opposite, in part by sticking to our principled approach to investing, which is designed to keep us rational in a sometimes irrational world. In this regard, Fintech’s investment management team is prepared to be buyers if and when valuations provide an attractive buying opportunity. Making sure your financial strategies accurately reflect what’s important to you and your specific needs, is critically important. 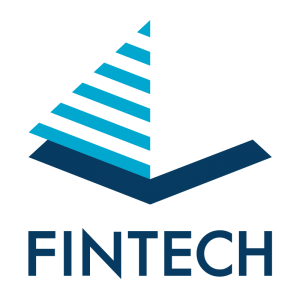 Fintech Financial Services provides advice relating to your level of income, tax, assets, debts, risks (personal and business), family needs, health, savings and desired lifestyle. A key element is constructing your investment structure and portfolios in line with your Investment Risk Profile, tax effectiveness and to provide the level of certainty you require over the long term. Please contact our office if you would like to review your situation and determine the financial strategy options that will assist you secure your future. https://www.fintech.com.au/wp-content/uploads/2018/12/theresa.flag_.burning.jpg 326 608 Jay https://www.fintech.com.au/wp-content/uploads/2017/08/Fintech_Primary-Portrait@2x-300x300.png Jay2018-12-21 01:48:452018-12-21 13:07:35Rising Investment Volatility: How Concerned Should You Be? Watch the Quarterly Market Update for November 2018 by Beulah Capital’s Director, Tom Elliott and CEO, Christian Ryan – part of the Investment Management team for Fintech Private Portfolios. Watch the Quarterly Market Update for August 2018 by Beulah Capital’s Director, Tom Elliott and CEO, Christian Ryan – part of the Investment Management team for Fintech Private Portfolios. This Budget will be the last before the next federal election (due by May 2019) and not surprisingly, the proposals include a range of pre-election sweeteners. However, Treasurer Scott Morrison is also keeping the focus on a return to a surplus. Thanks to an improvement in the budget position of around $7bn per annum, the path to surplus has been made relatively easy for the Turnbull Government. The modest fiscal stimulus will help households, but the main risk is that the revenue boost seen this year is not sustained and the budget continues to have relatively optimistic assumptions regarding revenue growth. The Government’s stronger corporate revenue has mainly come from reduced tax losses and higher commodity prices. Added to this is stronger personal tax revenue thanks to higher employment and reduced spending. As a result, the 2017-2018 budget deficit is projected to come in at $18.2bn compared to $23.6bn in the Mid-Year review. Impact on the Reserve Bank of Australia’s interest rate settings and the share market is likely to be minimal, if at all. The Government has assumed that much of this revenue boost will continue (see the ‘Parameter changes’ line in the table below) and has only used a small part of it to fund tax cuts and other measures. The net result is that the budget is projected to continue to track to a surplus. This is now expected to be reached one year earlier in 2019-2020 albeit only just at $2.2bn in the positive or 0.1% of GDP. The move back to surplus is slowed slightly by the fiscal easing from policy changes, which are predominately tax cuts. 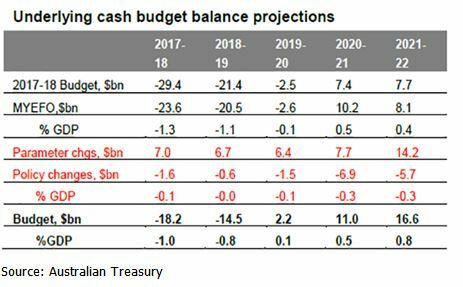 For example, the 2018-2019 deficit is projected to fall to $14.5bn but it would have fallen to $13.8bn were it not for the tax cuts announced. The planned tax cuts for higher income earners over the next decade are designed to satisfy the Government’s commitment from the 2014 Budget to cap tax revenue at 23.9% of GDP (or total revenue once dividends are allowed for as shown in the chart below at 25.4% of GDP). This is on the basis of the historic highs reached in the Howard resources boom years, and this cap is now projected to be reached in 2021-2022. The 2018-19 Budget has a sensible focus on providing a small boost to households (with the full impact of tax cuts not occurring until next decade) and to infrastructure at the same time as maintaining a return to surplus. The main risks are around whether the recent revenue windfall to the budget proves temporary and the assumptions for continued strong revenue growth. If you would like to discuss the implications of any of the 2018 Federal Budget announcements to your personal situation, please contact Fintech Financial Services on telephone 07 3252 7665. Note: These changes are proposals only and may or may not be made law. Low and middle income earners are to benefit from tax savings of up to $530 per person (or $1,060 per couple). This is mainly achieved by lifting the Low Income Tax Offset and raising the $87,000 tax threshold to $90,000. Dropping the planned 0.5% Medicare Levy increase, which will remain at 2%. Funding for home care services and residential aged care will increase, and new products listed on the Pharmaceutical Benefits Scheme. An extra $25bn in infrastructure spending including the Melbourne rail link, Bruce Highway, Gold Coast/Brisbane M1, road and rail in WA and North-South Corridor in SA. This is only partly offset by various savings including an illicit tobacco tax and the usual tax integrity measures to target the black economy and multinational tax avoidance. Ongoing commitment to cut the corporate tax rate to 25% for large companies by 2026-27. People aged 65 or over can make ‘downsizer’ super contributions of up to $300,000 from the proceeds of selling their home. First home buyers who have made super contributions under the First Home Super Saver Scheme can access their money for eligible property purchases. Where the annual concessional contribution cap is not fully utilised, it may be possible to accrue unused amounts for use in subsequent financial years. Further information on these opportunities can found at the end of this summary. Low and middle income earners will benefit from initial tax savings of up to $530 per person (or $1,060 per couple) in the 2018-2019 financial year, then via a series of further tax cuts to be implemented over seven years. Treasurer, Scott Morrison has a plan to fundamentally reform the tax system with changes to the income thresholds in 2022, and in 2024. The tables below show the impact of removing the 37% tax bracket and having the 32.5% tax bracket go all the way up to $200,000 on 1 July 2024. A Low and Middle Income Earners Tax Offset of up to $530 will apply from 1 July 2018 to 30 June 2022. From 1 July 2022, the Low Income Tax Offset will increase from $445 to $645. Table 2 below illustrates the tax payable in future financial years (and the potential tax savings compared to 2017/2018) for a range of taxable incomes. These figures take into account the proposed personal income threshold and tax offset changes. The previously proposed increase in the Medicare levy to 2.5% from 1 July 2019 has been abandoned. Small businesses with turnover of less than $10 million will be able to immediately write-off newly acquired eligible assets valued at less than $20,000 for a further 12 months. A person aged 65 to 74 is currently able to make contributions to superannuation if the ‘work test’ has been satisfied (i.e. they have worked at least 40 hours in 30 consecutive days) in the financial year the contribution is made. A one year exemption from the work test will apply to older Australians who have less than $300,000 in total super savings. This exemption will apply to the financial year following the last year the work test was satisfied. This will allow an additional period of time for those eligible to contribute to superannuation. have an account which has not received a contribution in 13 months and are considered inactive. Measures will be introduced to reduce the impact of fees on low super balances and focus on returning lost super to members. Protection will be provided to super accounts by limiting administration and investment fees to a 3% annual cap. This cap will apply to accounts with balances below $6,000. Exit fees will also be banned on all super accounts. A $6,000 threshold will apply to inactive accounts. These accounts will need to be transferred to the ATO. The ATO will increase data matching activities to return amounts to active accounts held by members. The ATO will develop new compliance processes for taxpayers claiming a deduction for personal superannuation contributions. This includes raising awareness regarding the necessary steps, including lodging a ‘notice of intent to claim a tax deduction’ form with the super fund trustee. Employers are required to pay Superannuation Guarantee (SG) based on an individual employee’s income. For some individuals this means their concessional contribution cap is breached by the total of multiple employers’ compulsory contributions. Individuals who have a total income exceeding $263,157 pa and multiple employers will have the option to elect to no longer have SG contributions paid on certain income from their employer. This overcomes the inadvertent breach of the concessional contribution cap and associated tax penalties. Self-managed superannuation funds (SMSFs) are limited to having four members. This threshold will increase to six to provide greater flexibility and allow families, for example, to all be members of the same SMSF. SMSFs with a history of good record-keeping and compliance will move from providing an audit on an annual basis to a three-yearly cycle. Eligible SMSFs will be those with a history of three consecutive years of clear audit reports and have lodged annual returns on time. The Pension Loans Scheme allows eligible individuals to access some of the equity in the home or other property via a Government loan, which is advanced in fortnightly instalments. This scheme will be available to all Australians over Age Pension age and the maximum loan payments will increase to 150% of the full Age Pension. Eligibility will continue to limited by the value of the property used as loan security. The following table summarises the payment ranges for singles and couples based on current rates, where the full pension and no pension is available. Under the Work Bonus, the first $300 per fortnight (currently $250) of employment income will not count when calculating Age Pension entitlements under the income test. Self-employed retirees will be able to access the scheme for the first time. A ‘personal exertion test’ will ensure the bonus only applies to income earned from paid work. Any unused Work Bonus (up to a total of $7,800 pa) can continue to be accrued to reduce assessable employment income in a future period. Favourable social security rules will be introduced to encourage the development and use of income products that will help retirees reduce the risk of outliving their savings. Under the proposed rules, only 60% of the amount initially invested in these ‘lifetime income streams’ will be assessed under the assets test. This concession will apply until the account holder is 84 (or for a minimum of five years). After this time, only 30% will be assessed for the rest of the person’s life. Also, only 60% of the income payments will be assessed under the income test. As previously announced, the Carer Allowance and Carer Allowance (child) Health Care Card will be income tested. Households earning over $250,000 won’t be eligible. Both existing and new recipients of Carer Allowance will need to meet this income test. grants for aged care facilities in rural, regional and remote areas. Individuals aged 65 or older may be able to make super contributions of up to $300,000 (or $600,000 per couple) from 1 July 2018 when selling their home. These contributions, known as ‘downsizer contributions’ can be made without having to meet a ‘work test’ or ‘total super balance test’ and they don’t count towards the contribution caps. However, they must be made with 90 days of settlement and a tax deduction can’t be claimed. The property must have been owned for at least 10 years and have been the main residence at some time during this period. First home buyers who have made super contributions under the First Home Super Saver Scheme (FHSSS) can access their money from 1 July 2018. The FHSSS started on 1 July 2017 and allows eligible first home buyers to save a deposit in the concessionally taxed superannuation system. Contributions of up to $15,000 per year (and a total of $30,000) can be made and they count towards the relevant contribution cap. An online estimator is available to explore the potential benefits of using the FHSSS. Where the annual concessional contribution (CC) cap is not fully utilised from 1 July 2018, it may be possible to accrue unused amounts for use in subsequent financial years. The CC cap is currently $25,000 pa1. Counted towards this limit are all employer contributions (including super guarantee and salary sacrifice), personal tax deductible contributions and certain other amounts. Unused cap amounts can be accrued for up to five financial years. 2019/20 is the first financial year it will be possible to use carried forward amounts. To be eligible, individuals cannot have a total super balance exceeding $500,000 on the previous 30 June. This measure could help those with broken work patterns and competing financial commitments to better utilise the CC cap. It could also help to manage tax and get more money into super when selling assets that result in a capital gain. This cap applies in FY 2017/2018 and 2018/2019. It may be indexed in future financial years. 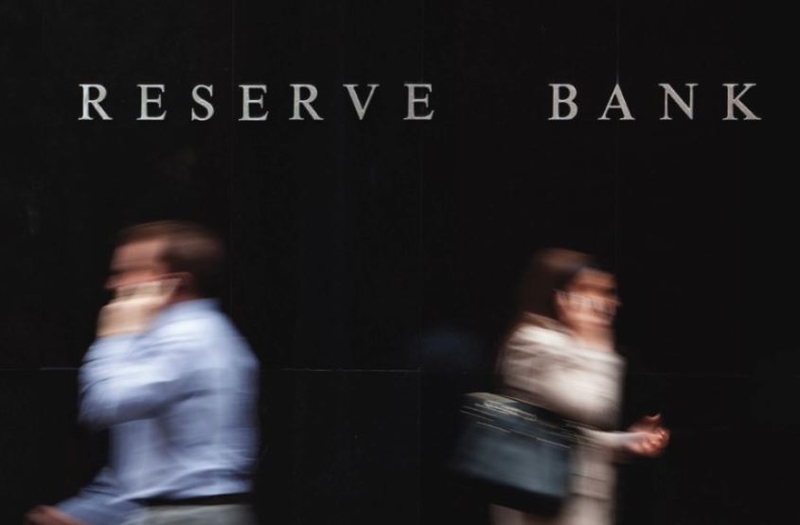 The Reserve Bank of Australia (RBA) has kept Interest Rates on hold at 1.5% for the 19th consecutive month at its monthly board meeting on Tuesday – but this is not a time to be complacent even though rates are likely to stay low for the time being. Australia’s central bank has signalled on several occasions that the next cash rate move is likely to be up. Whilst we agree, we believe the “lower for longer” interest rate environment will continue until around the end of the 2018 calendar year. There are competing core factors in the current market place that make it unlikely that the official RBA rate will change before then. On one hand, high business confidence, strong jobs growth and the RBA’s own growth and inflation forecasts argue against a rate cut. However, on the other hand, downwards pressure on consumer spending, weak wages growth, low inflation, the slowing Sydney & Melbourne property markets and the stubbornly high Australian dollar argue against a rate hike. The eastern coast residential property market (particularly Sydney & Melbourne) is also showing signs of a soft landing. A controlled slowdown in the housing sector will be a welcome outcome for the RBA. In addition, the current rate of unemployment, although lower than a year ago, only crept higher from 5.4 per cent to 5.5 per cent in February 2018. Even though these counterbalancing factors have created remarkably steady interest rates for 19 consecutive months, this is not a time to be complacent about the future impact of rising interest rates. We are advising clients to start preparing for interest rate increases from the end of the 2018 calendar year. This is particularly important for clients with high levels of debt against residential property who are making fixed ‘Interest Only’ repayments right now. This is because the Australian Prudential Regulation Authority (APRA) – who oversee the banks – restricted the ability of the banks to provide new ‘Interest Only’ loans to investors and homeowners more than a year ago. These macro-prudential policies were put in place as an alternative to rates being increased and to curb the rate of lending in the property sector. Prior to this, an increased number of 1 – 5 year fixed term ‘Interest Only’ loans were established, given the lower level of repayments required. When these come to an end, they will typically be restructured to ‘Principal & Interest’ loans. This means that the size of repayments investors will have to make to service the principal & interest loans will significantly increase. On top of this, interest rate increases in the future will add more cash flow pressure to them. We are advising our clients to review their incomes and cash flow to ensure they are able to stay liquid and grow their wealth during this change in the long term interest rate cycle. The only good news in this scenario is for those investors looking for a better rate of return on their cash at bank or term deposits; as interest rates rise. Please contact our office if you wish to discuss any of the above further in relation to your specific circumstances. What Does The Brexit Vote Mean for Your Investments? As you may be aware form the extensive media reports, Britain has voted to leave European Union (EU) and Prime Minister David Cameron has resigned. The Brexit Leave campaign secured 51.8% of the total vote, in somewhat of a surprise outcome as the general market consensus was that the result would be close but that the British people would end up voting to stay in the EU. Prime Minister David Cameron, addressed the British nation watched on by his wife Samantha at 5:20pm AEST. The British Cabinet will meet on Monday and a timetable for David Cameron stepping down will be drawn up. “I am very proud to have been Prime Minister of this country for six years…. Mr Cameron also added that he would attend the European Council next week to explain the decision that the British people have taken and his own decision, stating that “those on the losing side of the argument, myself included, should help to make it work.” Mr Cameron ended his stoic speech with a quiver of emotion as he stated his love of Britain. The Bank of England governor Mark Carney has made the following statement…”It will take some time for the UK to establish a new relationship with Europe and the rest of the world. So some market and economic volatility can be expected as this process unfolds, but we are well prepared for this. Her Majesty’s Treasury and the Bank of England have engaged in extensive contingency planning and the chancellor and I have remained in close contact including through the night and this morning. The Bank of England will not hesitate to take additional measure as required, as markets adjust. Donald Tusk, the president of the European Council, has appealed for calm and says the must be no “hysteria” about the British result. Mr Tusk stated that there will be “no legal vacuum” and EU law will continue to apply until Britain formally leave. There are serious “political consequences” for the UK but leaders are “prepared”. While England voted overwhelmingly for Brexit, Scotland and Northern Ireland voted strongly to Remain. The city of London also voted 59.9% to Remain but the turnout there was lower than expected because of bad weather. However, the British Midlands and North East regions voted overwhelmingly to Leave. Harry Potter author J. K. Rowling has hinted that she may switch to supporting Scottish independence in a second referendum in the hope of keeping the country in the EU. She suggests that many people who voted no in the last referendum could well switch sides. Following the announcement late this afternoon, the British pound immediately crashed to the lowest level since 1985 and the FTSE 250 index plunged a whopping 11.7% in the first few minutes of trading. In Australia, the news of the pending British exit from the EU caused the All Ordinaries to crash 3.17% before close of trading earlier in the day. From what started off as a positive session in the Australian share market, all sectors finished the day in negative territory with the big miners and big four banks being heavily sold off. BHP shed more than 8% and the major banks dropped between approximately 3% and 4%. The S&P/ASX 200 index closed 168 points down to finish at 5,113. However, over the week the index lost 50 points. In other markets, the Australian dollar fell by 4%, and Australian bond prices rose by 2-3%, gold rose 5% and oil prices fell by a similar amount. Events such as the Brexit vote highlight the value of having a high quality, well-structured diversified portfolio utilising market leading research. Not only are you diversified across asset classes, investment sectors and regions, you are also buffered by currencies during Global market events. Given that the Australian dollar usually sells off along with shares in global shocks, falls in international share prices are usually largely offset by currency gains as the Australian dollar falls. We have been largely un-hedged on currency risk for international shares in your portfolio, which means that falls in international share prices are partially offset by falls in the dollar in sell-offs. This has occurred in many prior market shocks, and it happened again today. Asian shares fell be around 4% (and European and US shares are also expected to sell off when their markets open Friday night our time). However the Australian dollar also fell by 4% on Friday, so the Australian dollar value of international shareholdings in portfolios was largely unchanged as the currency gains largely offset share price falls. Another buffer in portfolios is bonds. In broad market shocks, bonds generally gain in value, helping to offset falls in share prices. All your diversified portfolios contain holdings in high quality corporate bonds. Losses on Australian shares were partially offset by gains in Australian bonds in your portfolios. Also, when European and US markets open tonight our time, international bond prices are expected to rise, and this will further help offset falls in international shares in your portfolios. Direct impacts in Australia are likely to be relatively minor. The British pound fell 9% on the news of the vote, and that will benefit British exporters to Europe. But the days when Britain was a major trade partner with Australia are long gone. For the first 150 years of Australian history Australia was a British colony and benefited from preferential trade ties with the mother country. But that was all undone when Britain joined Europe. Britain leaving the EU now will have very little direct impact on Australia as the vast majority of Australian trade is now with Asia. The people of Australia are likely to gain some confidence once the Federal Election is decided on 2 July and create a stabilising influence on our economy and markets. More than likely the sudden sell-off in shares and offsetting sudden rally in bonds is likely to stabilise and reverse. Even the bombing of Wall Street on September 11, 2001 and the Japanese tsunami and nuclear crisis in mid-March 2011 were quickly forgotten as markets recovered within a few weeks. If the Brexit leave vote is confirmed. A full British exit of the EU is likely to require many hundreds of pieces of legislation and administrative steps that may take many months or years to complete. In that time other more pressing issues are likely to take over the headlines. These include the pace of the US economic recovery (following their Presidential election in October this year), the Chinese stimulus program, the military build-up in the South China Sea, and so on. Aside from the immediate impacts on markets, the likely substantive impact of the Brexit is likely to be a general slowdown in business investment, hiring and consumer spending in Britain and Europe as businesses and consumers wait to see the practical outcome of the vote. The downside of this is that it is likely to slow economic growth and employment, but the upside is that it will also probably lead to lower interest rates for longer – in both Europe and in the US. Thus the impacts on company revenues and profits is likely to be mixed. We will continue to ensure your portfolios have exposure the companies that are best positioned to benefit from these changes. Over the long term the Brexit may well turn out to be the start of a fragmentation of the EU system. The idea of a pan-European economic block had clear advantages in promoting trade, investment and economic growth, especially in the 1970s and 1980s. But the downside has been the crippling creep of increased regulation and taxes, which has hampered productivity growth and innovation. It may well be that the best days for the EU are over and Britain, along with other countries that follow the exit, may progress more quickly free of the stifling bureaucracy of Europe. Given that your portfolios have built-in buffers to soften the short term impact of sudden market sell-offs, we see no need to make knee-jerk reactions when the mechanics for a British exit and their implications on markets are so unclear at this stage. We will continue to monitor what is happening economically and politically in Australian and the rest of the world, and ensure your portfolios are positioned in line with your Investment Risk Profiles to get the best possible long term outcomes from the prevailing market conditions. Please contact me if you have any questions regarding the Brexit and your specific circumstances. https://www.fintech.com.au/wp-content/uploads/2017/12/brexit-referendum-uk-1468255044bIX.jpg 1271 1920 Grant Chapman https://www.fintech.com.au/wp-content/uploads/2017/08/Fintech_Primary-Portrait@2x-300x300.png Grant Chapman2016-06-22 22:26:382017-12-22 22:30:07What Does The Brexit Vote Mean for Your Investments?